On Saturday, 27 September 2014, the Friends of Cedars of Lebanon state Park gathered to celebrate National Public Lands Day and to show our appreciation for the Cedars of Lebanon state Park. The day started with a morning hike along the Dixon Merritt Trail led by Ranger Brian. Then the volunteers worked on restoring the picnic tables for Shelter 4. They disassembled the tables, removed staples and tape from the boards, planed, ripped and sanded them, painted the boards green (Skittles Green I’m told) and finally put them back together. It sounds fairly simple but was a lot of work. However, the tables at Shelter 4 now look like new tables. Later that evening, some of the crew gathered at the campfire site behind Jackson Cave and the Butterfly Garden, built a fire and roasted hot dogs. Unfortunately, nobody thought to snap pictures at the campfire because we were all either too tired or too busy playing with Drake, Emily’s 7-week old Australian Shepherd puppy. But the night sky was beautiful, the crickets and frogs were almost deafening, and even a few fireflies showed up. And the hot dogs went fast after a 10-hour work day. Thanks to all who pitched in and made NPLD 2014 a fun and productive day. 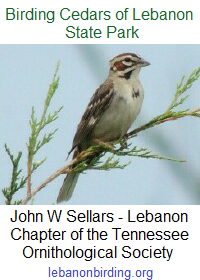 This entry was posted in Photos, Public Event and tagged Cedars of Lebanon State Park, friends of cedars of lebanon, NPLD, tennessee, Tennessee State Parks, volunteers, wilson county. Bookmark the permalink.